Jane the Virgin is skipping a week, so today I'll be talking about something very near and dear to my heart: Nacho Libre. This movie. THIS movie, man. It's my childhood in a nutshell. Though they do exaggerate some things about living the Hispanic life, it's pretty much accurate. 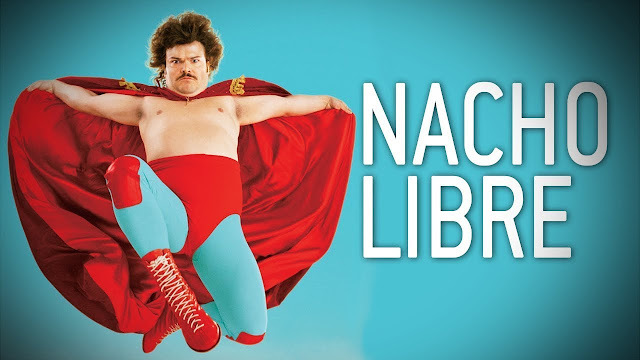 For those who don't know what Nacho Libre is or are aware of its hilarity, allow me to explain. We follow Ignacio, a young man living as a priest in a Catholic church serving the orphans who live there after being an orphan himself. Sounds like a real heart-wrencher, right? Wrong. Ignacio longs to be a wrestler, but alas, it says in the Bible not to wrestle your neighbor. But when Ignacio finds a loophole in the gospel (donating the money he wins in wrestling to the orphans), he goes under disguise as Nacho, the luchador. My kind of humor is the stupid kind, when something is so stupid you just have to laugh. Nacho Libre definitely has this, from the blank stares of the orphan Chanco to the awkward toast chewing between Encarnacion and Ignacio. I've laughed so hard at this movie I haven't been able to breathe, specifically at this joke. Maybe that's just me because with all the Hispanic influence, this movie feels like one big inside joke. Which leads me to my next point. This movie takes place in Mexico and is highly influenced by the culture. Though in English, everyone has thick Spanish accents. Crosses are worn, spicy corn is eaten, and much hilarity is had. Growing up around Hispanics, it's funny how accurate this movie can be. Have you ever seen Nacho Libre? What did you think of it? Nacho Libre is one of my favorite comedies. :) It's also one of the most quoted movies in my family's conversations! I haven't seen this... but I've actually heard a lot about it. I think I'll check this one out.